Change bears within itself what is already past, but also that which will someday come to pass … The origin of the programme “Le Phénix” is more than the exciting contrast between tradition and modernism. Here, the world of the transformable sound is paramount, allowing the recorded pieces to flow into each other or to be abruptly interrupted. Virtuoso flexibility, static fragility and dark energy are directly related here. Groundedness and vulnerability, the broad spectrum of sound and pitch, as well as the versatility of the double bass – also in the way of playing it – once caused my inner strings to vibrate. Up to the present day, this instrument continues to give me new inspiration in the search for a living repertoire that completely embraces the double bass. My own artistic openness and curiosity lead me on this path. All the works on this CD support my own joy of playing and radiate an openness for what is new – in some cases through the context in which they arose. Transcribing works is the order of the day for double bassists; our repertoire is limited and only finds its own independent sound form in the modern period. The combination of double bass and harpsichord on this CD is reminiscent of and acknowledges “the grand period of the gamba”. The summary as a concept scheme in the alternation of tension between “old and new” makes an exciting overall work out of the seven individual pieces included here: Glass with Bach with Pärt with Corrette with Zbinden with Händel. The Sonata No. 5 of Antonio Vivaldi convinces listeners through the balance of its four movements and the beauty of its themes. The solo sonatas were performed as divertimenti at the court; the delight in playing and listening that one can hear and sense in the Sonata No. 5 brings this image to life. It was only during this Venetian composer’s lifetime that the violoncello became emancipated to the status of a solo instrument. Until then, the intimate sound of the gamba was far more popular amongst the nobility who “set the tone” – the social class that cultivated chamber music. Playing instruments of the violin family, from which the violoncello comes, was not at all highly regarded in this social stratum. Hopefully the cellists will forgive me for having succumbed to the cantabile beauty and the “swing” of this Sonata and for playing the piece in the same register on the double bass. I regard Façades by Philip Glass as a shadow work to Vivaldi’s Sonata which abounds in life. The piece was written in 1981 as film music for Godfrey Reggio’s film Koyaanisqatsi (which means “unbalanced life” in the language of the Hopi Indians). With neither actors nor dialogue, the film describes the collision between two cultures. The music accompanies the apocalyptic images of an empty New York – the symbol of coldness and of the incompatibility of city life and its technical aids with life in nature. My transcription of Façades brings together all the instruments participating on this recording – four double basses, harpsichord and piano – as well as the spectrum of colours and movement of this CD. The warmth of the accompanying double basses and piano in contrast to the bitter coldness of two solo double basses in unison and the harpsichord allow one to sense vast abysses. The forlornness of Façades can still be heard in the first movement of the 2nd Gamba Sonata, BWV 1028 of Johann Sebastian Bach. Musicologists wonder whether this sonata was originally written for another instrument, just as Bach’s Gamba Sonatas 1 and 3 were originally composed for two transverse flutes and continuo – the First Sonata was demonstrably so and the Third most probably. Today, the gamba sonatas are amongst the composer’s best-known chamber works and are played by flutists, cellists, violists and double bassists. All the sonatas are very contrapuntally conceived; both hands of the harpsichord and the gamba, or, in this case, the double bass, are on an equal footing. Especially striking in the Second Sonata is the concertante fourth movement, which also contains modern elements in the virtuoso cadenzas of the two solo instruments. Whilst playing this final movement in concerts, I find myself already internally looking forward to Arvo Pärt’s Spiegel im Spiegel, in which Bach’s verve and vitality reverberate like an echo. In this piece, everything and nothing is possible; the interpreter’s task is to personally hold himself/herself back as much as possible. Each listener receives the space here that he/she gives himself. As in Michael Ende’s poetry collection Der Spiegel im Spiegel: Ein Labyrinth of the same name, there is no escape from Pärt’s sonic labyrinth. The individual, ever farther removed, repeatedly sinks back to the starting point, the central tone a. Arvo Pärt has been adapting several of his pieces for the most varied instruments for a long time, realising that there is more to it than merely instrumental playing – it’s about a spiritual essence that speaks to the listener subconsciously as well. 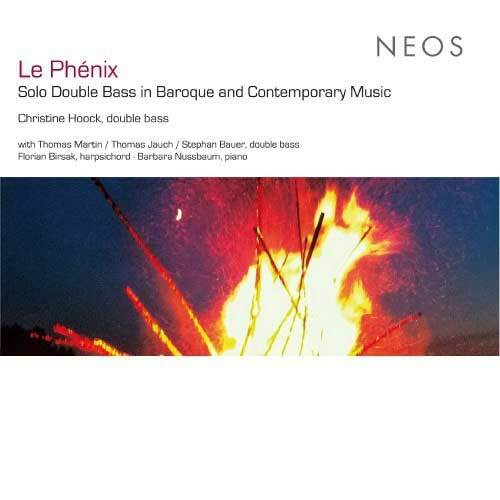 The Concerto Le Phénix by Michel Corrette, to which this CD owes its title, conveys the exuberance of the here and now. One can immediately sense its panache and dancelike lightness from looking at the score. The subtitle in Corrette’s score reads: “Concerto for four bass instruments” – for me a personal invitation to perform this piece, usually played by cellists or bassoonists, with four double basses. The double bass can develop its astonishing spectrum of sound and pitch both as a solo instrument in the first part and as continuo – and as an orchestral instrument in the second to fourth double bass parts. The Hommage à J. S. Bach by Julien-François Zbinden – a sonic “original work” for double bass – decidedly interrupts this sumptiousness. This solo piece by the Swiss composer was written in response to a commission for the ARD Music Competition (Munich). It is a work that really understands the double bass and demands a lot from it. It unites the mounting elemental force in the beginning and the baroque-jazzy second part with the fragile brittleness of the instrument in the final part of the work. This piece’s own “swing” and its compelling expressive strength are additionally enhanced by the continuous presence of the notes b–a–c–h. It is the almost verbal power and the simultaneous echo of vulnerability at the end of Zbinden’s Hommage that makes the Trio Sonata HWV 393 of Georg Friedrich Händel appear so conciliatory. Originally composed for two violins, it is ideally suited to the double bass in terms of playing technique. Today, the work is usually performed with oboe and violin. With two identical instruments, the sound is so interwoven that one can hardly separate them. This sonic amalgamation is a delight for the originally team-orientated double bassist.